By default, your Nikon D3400 camera stores all images in one folder, which it names 100D3400. Folders have a storage limit of 999 images; when you exceed that number, the camera creates a new folder, assigning a name that indicates the folder number — 101D3400, 102D3400, and so on. You’re also given a new folder if a file in the current folder is numbered 9999. If you choose, you can create your own folder-numbering scheme. For example, perhaps you sometimes use your camera for business and sometimes for personal use. To keep your images separate, you can set up one folder numbered 200D3400 for work images and use the regular 100D3400 folder for personal photos. Display the Setup menu and select Storage Folder, as shown on the left. Use this Setup menu option to create custom-numbered folders and specify the folder you want to use to hold the next shots you take. The number you see along with the Storage Folder option reflects the first three numbers of the folder name (100, in the figure). During playback, you see the entire folder name (100D3400, for example) in playback modes that show the folder name. 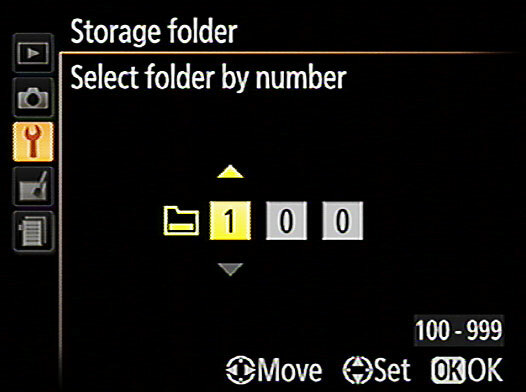 Choose Select Folder by Number, as shown on the right. You see the screen shown here, with the current folder number shown in the middle of the screen. Press the Multi Selector right or left to highlight a number box; then press up/down to change the number. A folder icon next to the folder number indicates that the folder already exists. A half-full icon like the one here shows that the folder contains images. A full icon means that the folder is stuffed to its capacity (999 images) or contains a picture with the file number 9999. Either way, that full icon means that you can’t put any more pictures in the folder. Assign the new folder a new number. Press the Multi Selector right or left to select a number box; then press up/down to change the number. When you create a new folder, the little folder icon disappears because the folder doesn’t yet contain any photos. The camera creates your new folder and automatically selects it as the current storage folder. Each time you shoot, make sure to verify that the folder you want to use is shown for the Storage Folder option. If not, select that option and then choose Select Folder by Number to enter the folder number (if you know it) or choose Select Folder from List to pick from a list of all available folders.